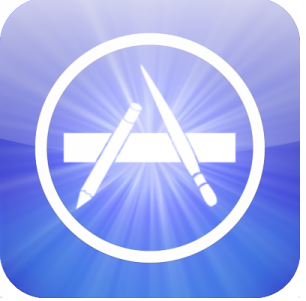 We all know there are many genres of app in the iTunes store and literally day by day the assortment of grows. 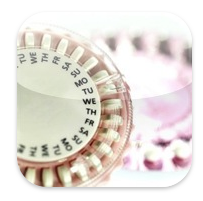 This one, The Pill, relates to the birth control contraceptive pill and is obviously very important and to many part of everyday life. 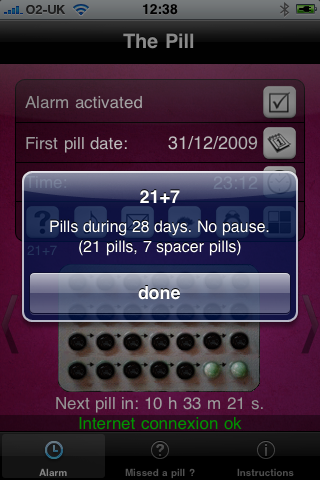 This app aims to ensure you remember when to take your pill helping to prevent unwanted pregnancies. We spoke with Stephane Queraud, developer of this app to find out what his inspiration was and how the app development process works in the Medical genre. Read this interview for an awe-inspiring insight into the world of app development. Thank you Stephane for speaking with us, can you tell our readers how your app was originally thought of, what were your thoughts behind the marketplace, specifically? Actually, it was my wife’s idea Joanne. She was often forgetting to take her pill, and sometimes taking pills from two different packs. It was easy to confuse days. So we had a look at the app store, and couldn’t find a good application (one or two were available, but they were not using push notifications and they didn’t calculate days automatically). So that’s why we have decided to create this application, which will help her with this problem. 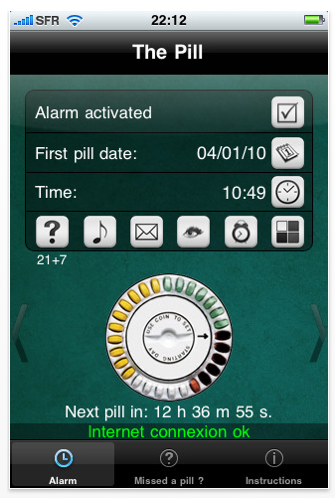 Also, we thought that she was not the only one who would use such an application (google shows many forums talking about what to do if you forget a pill). 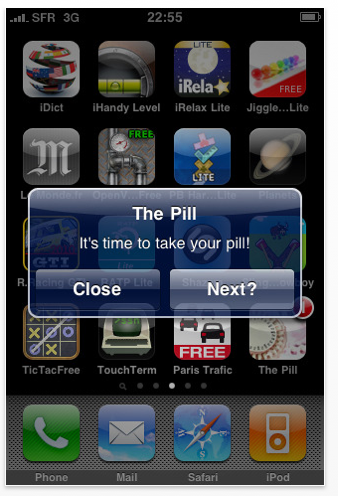 Compared to games or any other applications, this one is very specific for women, but we thought there could be a little place for The Pill. Stephane, can you tell us how you came up with the colors and themes ideas, design? The first version was a little too simple, and we chose something pink (which was maybe not a good idea). 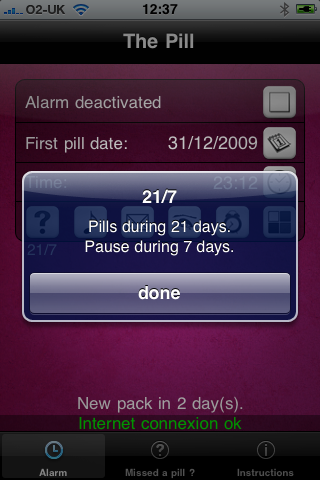 We wanted to keep this application very simple: 3 buttons to activate the alarm, choose the date and time. For the v2.0, we wanted to give more controls, functions, and a better design. We are pretty happy of the result. Who do you see as the main target market for this app Stephane? 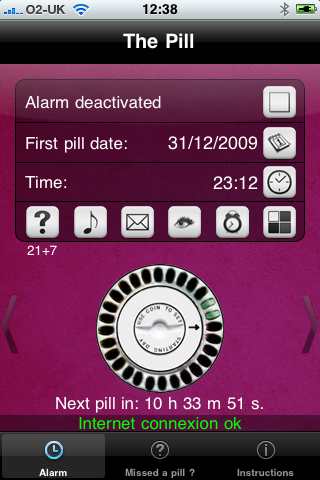 The main target is of course women, but also we have some men who are using The Pill so they can help their girlfriend or wife. People who take a pill every day could even use The Pill to take their medication, but of course it’s not the main usage of The Pill. 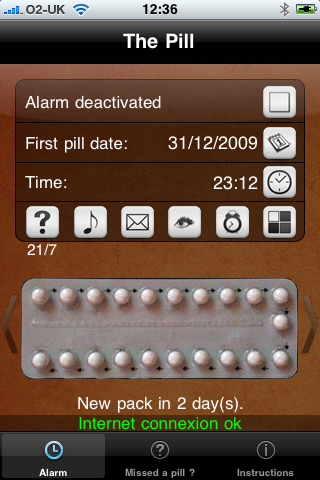 Have you had feedback from women that your app has helped them use The Pill more effectively, helping prevent unwanted pregnancies? Well, Joanne we had very few comments and reviews on the app store, but after some weeks, we found severals things to improve and to add. That’s why we started to work on the v2.0. 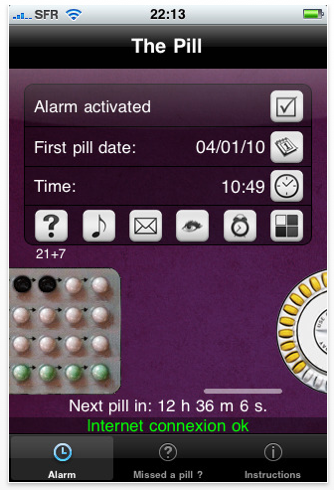 Comments are good, i guess that The Pill really helps women. How long did it take from the original planning to the production process of your app Stephane? all alone. Then, six weeks to get it approved by Apple. For the v2.0, it took me two weeks and only four days for the approval. My wife worked on all the translations. How do you view your sales, is there a good solid market for this style of app? In the beginning, we did not sell much (and we did not use any promotion to help). After two months we found a clone of our application and we saw that it had exactly the same features but a better design and they had more sales. So we worked on v2.0, added more functions, a better design and we spent a lot of time on promoting our app. What has been the hardest obstacle you have had to overcome regarding this app development? As a developer, i wouldn’t say there is big obstacle in the development. There is a lot of information in the documentation for all your needs. It’s actually harder to wait for news from Apple worrying whether the app be rejected or accepted ..
Would you consider developing apps for third parties? No, and i don’t have the time for that, Joanne. What have you learnt from the App Store since you launched your app? Patience – and also that promotion can’t be avoided if you want greater sales. Have Apple supported you well with your app? Not at all Joanne, and even worse, we saw this clone selected by Apple on the app store home page. Pretty unfair. What next, are you developing another app? Would you go for the same genre again, if not which? Yes, we are thinking about something else, another genre (not only for women). But it’s still not clear. The Apple Tablet – what are your thoughts about it Stephane? It looks great, I’m waiting for the announcement, and want to learn more about this 4.0 OS.